The Wilmer Elbow Orthosis (also called brace or splint) was developed by the Wilmer Group of Delft University of Technology. 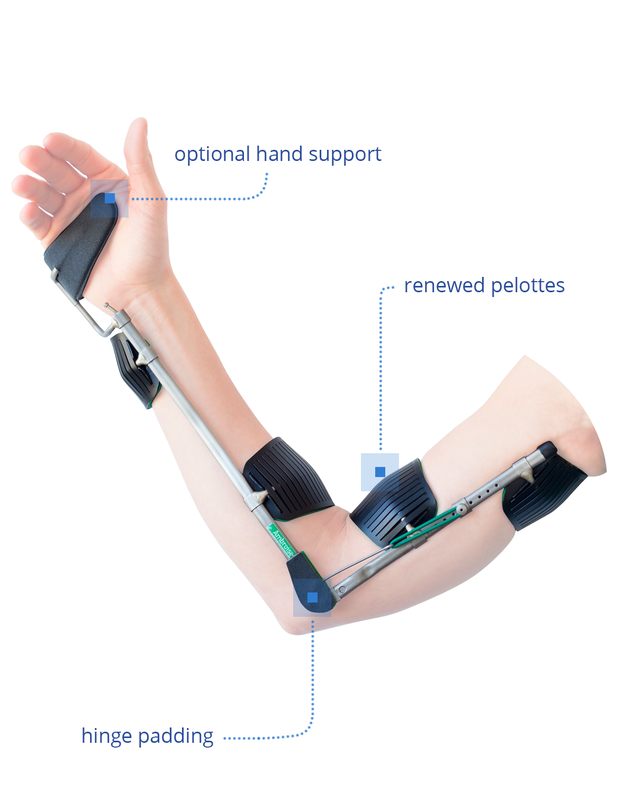 This orthosis is intended for people with paralysis of the muscles around the elbow. It’s an extremely lightweight orthosis (it only weighs 160g!) that allows the arm to restore some of its functional abilities. The Wilmer Elbow Orthosis on the arm. Because the orthosis is carried on the inside of the arm it is almost not visible. It’s cosmetic while it’s functional. The Wilmer Elbow Orthosis is truly a high-level engineering achievement. 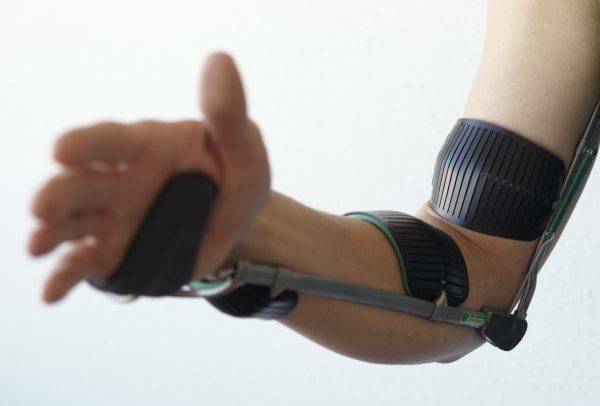 Due to its clever design, it is possible to move and lock the arm without having to use the other arm. During the design-proces a lot of attention has been paid to the user. As a result, the design is optimized for cosmesis and comfort. The orthosis is custom-made so that a perfect fit will give you the best comfort. A Wilmer Elbow Orthosis is intended for people with reduced control over, or failure of the muscles around the elbow. This, for example, can be seen in case of a Plexus Brachialis lesion. Also after a stroke (CVA), muscle failure may have occurred. The result may be that control over the elbow is impaired. That can have serious consequences. Even the simplest of actions like buttoning your shirt or zipping your pants, carrying a bag or opening a full coke bottle can all of a sudden appear almost impossible. With the Wilmer Elbow Orthosis, some functionality is restored to the paralysed arm. Locking mechanism can be operated by the paralysed arm itself. Arm on the unaffected side retains full freedom. Locking mechanism can be turned off. High wearing comfort. Can be worn underneath clothing. Custom made and therefore perfect fit. Only supports the paralysed arm, but the fingers and hand remain free. Supports arm but also the hand with a hand support. All units are available in one size in left and right models that are custom fitted to the arm. Optionally worn on the outside of the arm, but then a left-hand version for the right arm is used. In flexion contractures and/or spasticity, the Wilmer Elbow Orthesis is not suitable but the Wilmer Stretching Orthosis could be considered. A paralyzed arm can be caused by damage to the ganglion of the arm: Brachial plexus lesion. This can be caused by a broken bone (usually the clavicle, since the brachial plexus is located just behind this bone) or constriction of the nerves, for example after a motorcycle or bicycle accident. In the case of a plexus lesion, we call it a limp or flail paralysis. The control from the brain can also no longer function properly, for example as a result of a stroke (CVA). In that case, there is often a spastic paralysis. The effects of a paralysed elbow can have a huge impact. The arm can not be lifted properly so that objects can no longer grabbed, carried, or lifted. 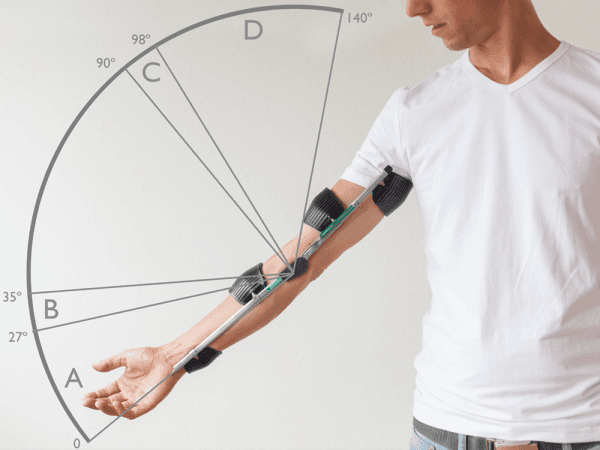 The arm loses an important part of its function. And if that’s not enough, you can not keep the arm in position. For people with a flail paralysis (eg after plexus brachialis lesion), it means that when moving the torso, the arm begins to move due to inertia, without being able to control it. 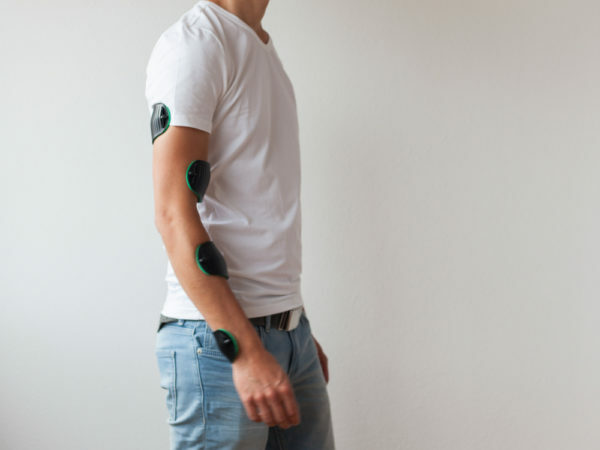 This so called “arm sway” can be extremely annoying and results to the arm to easily bump against chairs, tables and walls, which can damage the arm or hand. For people with a spastic paralysis (eg after CVA), this may mean that the arm is pulled in maximum bending unexpectedly during a spasm. That is also very annoying. Especially if the spasm complaints last longer, this can be painful and lead to shortening of the muscles, so that the arm can not be fully stretched any more. For this population of patients, the Wilmer Elbow Orthosis is less suitable. In that case, you may benefit from the Wilmer Stretching Orthosis. The 35° locking position of the Wilmer Elbow Orthosis is intended to reduce the “arm sway” during walking. This position is the natural state of the elbow while moving the arm while walking. The lock ensures that the arm stays in the plane with the body, so that you control the arm and its movements again. Your arm movements appear natural again, even during walking. You no longer need to tuck your arm away in the pocket of your jacket. How do I get the Wilmer Elbow Orthosis? The Wilmer Elbow Orthese is custom made. For optimal operation and good comfort it is important that the orthosis fits well. After all, you need the orthosis every day throughout the day. Therefore, the Wilmer Elbow Orthosis is measured and fitted by professionals, such as a certified orthotist. The Wilmer Elbow Orthosis is prescribed by your physician. In most cases, this will be the rehabilitation physician. In many cases, approval from your insurer is necessary. In the Netherlands all insurers pay the WEO provided there is a correct indication and motivation. Do you want a non-binding advice from one of our clinical experts about the possibilities of a Wilmer Elbow Orthosis in your situation, or do you want to know which professionals in your area have experience with this orthosis? Feel free to contact us. We are happy to assist you. 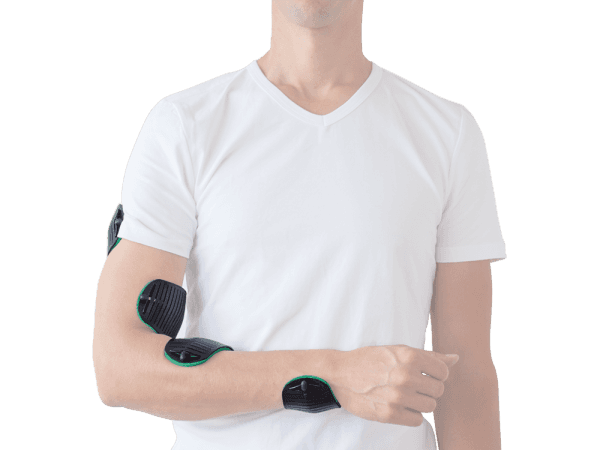 How does the Wilmer Elbow orthosis work? The Wilmer Elbow Orthosis contains a spring mechanism that helps to move your arm. In addition, the hinge contains a locking mechanism that can hold your arm stable at 90° so that you can carry something with your arm, for example a cup or bag (depending on the function of your wrist and hand). The elbow can also be locked in 35°. In this position you can move your arm with help from your shoulder, without the uncontrolled sway of your forearm . That’s the position in which you can have a normal arm swing while walking, without bumping it to something. Do you want to know in more detail how the Wilmer Elbow Orthese works? Check out our manual. Optional hand support If extra support of the hand is desired, a hand support can be provided. There are two versions of the Wilmer Elbow Orthosis. The standard version, without hand support, and a version with hand support. The latter is used if you have reduced control over your hand. See photo. Usually, the orthosis is worn on the inside (medial) of the arm. In that case the Wilmer Elbow Orthese is less visible, because most people see your arm from the outside. Sometimes, however, it is chosen to wear the orthosis on the outside (lateral) of the arm. For example, if contact between the orthosis and the torso is undesired.